WAIST HIGH: The Spirit Of '86. After more than twenty years the long awaited release date for The Alarm - Spirit Of '86 DVD has finally arrived! 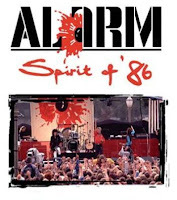 The Alarm - Spirit Of '86 concert, the legendary live worldwide broadcast, was first recorded in front of 25,000 Alarm fans at UCLA in Los Angeles on Apr. 12, 1986. The concert, with yours truly in attendance, was transmitted via a historic first-ever satellite transmission to millions of homes around the globe on MTV. Previously only ever available in the immediate aftermath of the concert, the original video was subsequently withdrawn at the request of the band (who were unhappy with the original unmixed sound quality), and has been out of print for over twenty years. The Alarm - Spirit Of '86 concert is now available as a special Collectors DVD/CD Digipak featuring a massive amount of content that took Mike Peters the best part of a decade to assemble after relentlessly searching for and eventually finding the original master tapes through the Capitol Records/MTV/Alarm archives. The Alarm - Spirit Of '86 concert features a complete digital restoration of the original footage re-edited and enhanced into a modern 16:9 widescreen format plus a complete remix of the concert audio into both stereo and 5:1 formats. The Special Edition Collectors Digipak also includes a full colour 12 page 85/86 Tour Program booklet and also includes a separate audio CD of the complete concert featuring for the first time ever the previously unreleased and legendary lost encore, "We Are The Light." Special features include a previously unseen 1986 interview with Mike Peters and guitarist Dave Sharp plus the original MTV concert trailer and backstage feature, the Strength album TV advert and all Strength album UK/USA videos together with previously unseen footage of The Alarm in concert at Rutgers University in New Jersey on Mar. 11, 1986. The DVD also includes a restoration feature including a brand new interview with Mike Peters. Included on the DVD is a special alternative acoustic concert soundtrack recorded by Mike Peters that has been synched to the original footage, providing a unique perspective on this historic Alarm performance. Individual audio commentaries from all the original group members plus Alarm manager Ian Wilson provide a fascinating insight into the inner workings and dynamic of the band during this period in time.